This small refrigerated cargo ship paid a brief visit to Glasgow in June 2003, and was seen passing below the Erskine Bridge. ICE QUEEN, at that time registered in Belize, had been built in Denmark in 1979 and was launched as GOMBA REEFER II but was completed as PACIFIC REEFER. 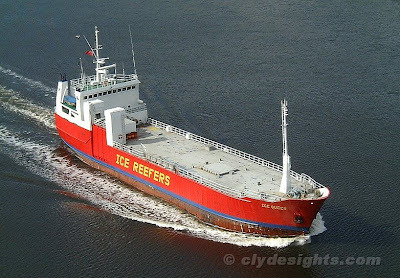 In 1990 she was renamed REEFER EXPRESS and became ICE QUEEN ten years later. Since 2005 she has been named SILVER ICE and has flown the flag of the Comoros. At 75.2 metres in length, ICE QUEEN had a deadweight of 2,175 tonnes. nice, not seen this little guy before.